Khan Yunis, Gaza Strip, June 1, 2018. Israeli tear gas canisters fall toward Palestinian protesters and medics during clashes with Israeli security forces along the Israel-Gaza border. Photo courtesy dpa picture alliance/Alamy Stock Photo. Over the past ten weeks, tens of thousands of Palestinians in Gaza have participated in the “March of Return,” mass nonviolent demonstrations to protest Israel’s illegal siege. Throughout, Israel has responded with violent force. As of June 7, Israeli forces had killed more than 110 Palestinians in the course of the protests, including 14 children, and injured more than 3,700 with live ammunition. In order to brutalize the people of Gaza into submission while minimizing the international criticism that accompanies lethal force, Israeli snipers deployed along Gaza’s perimeter fence methodically shot the legs of Palestinian demonstrators. “The aim,” reports the Israeli newspaper Ha’aretz, was “to leave as many young people as possible with permanent disabilities.” To this end, the snipers used expanding bullets that “pulverized” bones and left exit wounds the size of a fist. According to the Secretary-General of UNRWA, the United Nations agency providing education and healthcare for refugees in Gaza, “many” of those shot will suffer “life-long disabilities.” Mission accomplished. In order to legitimize its resort to overwhelming force, Israel has sought to cast doubt on the popular character of the demonstrations in Gaza and to present them as a threat to its security. A number of myths about the Gaza protests have consequently gained widespread traction. They bear as tenuous a relation to reality as Israel’s insistence back in the 1980s that the overwhelmingly nonviolent First Intifada comprised a “campaign of terror” by “mobs,” or, more recently, its repeated denials that the Israeli military deployed white phosphorus in Gaza during Operation Cast Lead. No one is suggesting that Palestinian forces have never engaged in violent forms of resisting Israel’s protracted, illegal siege—which has made Gaza “unlivable,” according to UN officials. But the current protests are overwhelmingly nonviolent, and have been met with murderous force. Here are some of the most prominent myths about these recent protests, and why they’re not true. The Government of Israel claims that the Gaza demonstrations have featured “violent mass incidents” that were “exceptional in their scope and the extent of threat they posed.” These violent incidents allegedly included the throwing of grenades and explosive devices, as well as the firing of live ammunition at Israeli soldiers. But such claims are either un-evidenced, implausible, or blown so out of proportion as to misrepresent what transpired. First, credible observers report that, while a minority of demonstrators threw stones and flaming bottles toward out-of-reach Israeli soldiers, the demonstrations “have largely involved sit-ins, concerts, sports games, speeches, and other peaceful activities.” An American journalist in Gaza found that, even among those demonstrators who approached the fence, “[t]here were no guns, no grenades, no rockets.” Fieldworkers for the respected Palestinian Center for Human Rights in Gaza “did not witness weapons or armed persons even dressed in civilian clothes among the demonstrators,” while Amnesty International informed us that, as of June 8, it had “not seen evidence of the use of firearms by Palestinians against Israeli soldiers during the protests.” This would explain why Israeli soldiers felt able to stand around in plain sight of the protesters while taking pot-shots into the crowd. Armed security personnel in civilian clothes were present at the protest tents—but not near the fence—in order to guard the high-profile political figures in attendance, obstruct intelligence-gathering by collaborators, and maintain public order. Although a couple of isolated violent incidents occurred far away from the perimeter fence, none of the numerous witnesses we contacted had seen even a single “armed protester” or any armed individual approaching the perimeter fence. Inasmuch as Israeli forces were equipped with sophisticated surveillance equipment, including “footage from drones hovering” overhead, and insofar as Israel claimed to use lethal force only against “those who are with weapons,” the lack of evidence of these alleged explosives and live ammunition is surely cause for wonder. What “evidence” Israel has provided only underlined the absence of a military presence at the demonstrations. Witness, for instance, the images and footage of what Israel termed “grenades” and “improvised explosive devices,” but which were in fact homemade firecrackers, familiar to Gazan teenagers who sometimes set them off at weddings and parties, which make a loud noise and little else. Mahmoud al-Zahar, a leading Hamas politician, has been quoted as saying that the peaceful demonstrations in Gaza were “bolstered by a military force and by security agencies.” This has been construed to be an admission that Hamas is “deliberately using peaceful civilians at the protests as cover and cannon fodder for their military operations.” But what Zahar actually meant was that the nonviolent demonstrations depend on protection from Hamas’s military deterrent. In the absence of an armed force in Gaza, Israeli soldiers would have simply crossed the fence, destroyed the tents, and arrested hundreds of demonstrators. Other Hamas figures have made the same argument in recent weeks, distinguishing between “nonviolent” resistance as pursued by Hamas and the “peaceful” strategy of the Palestinian Authority—which they associate with passivity and surrender. Hamas has issued strict orders that none of its members were to bring any weapons to the demonstrations. Even as Israel shot upward of 3,700 people with live ammunition, from the inception of the Great March on March 30, until its climax on May 14, not a single “rocket” was fired in response. Had Hamas intended to kill Israeli snipers, it could have done so from a mile away with its own sniper unit, rather than—as Israel alleges—smuggling armed militants among the crowds. Indeed, Hamas has released footage showing that Israeli snipers were within range of its forces. If only one Israeli soldier reported an injury, this is almost certainly because Hamas made a decision not to retaliate in order to keep the popular protests going. A Gaza resident informed Amira Hass, the respected Israeli journalist who lived for a sustained period of time in Gaza, Hamas that [Israel]”can’t force us to come and endanger ourselves.” “The people of Gaza,” another Israeli journalist with experience in the area pointed out, “are not robots.” One of the two writers of this article personally knows Hamas members who were urged repeatedly to join the protests—and not to run to the fence—but who decided to stay at home. Other Hamas members were begged by parents, superior officers, and party leaders to stay at home because they were valuable targets for the Israeli military (for instance, Moaaz and Abdul-Salam Haniyeh, two sons of senior political leader of Hamas, Ismail Haniyeh), but they attended the march regardless and even approached the fence against the advice and orders of virtually everyone around them. It has been reported that “clerics and leaders of militant factions” falsely claimed that the “fence had already been breached” in order to encourage protesters to rush it. But as an explanation for the demonstrations, this lacks credibility: Protesters could verify whether or not the fence had been breached with their own eyes, since the protest tents were located uphill from it. 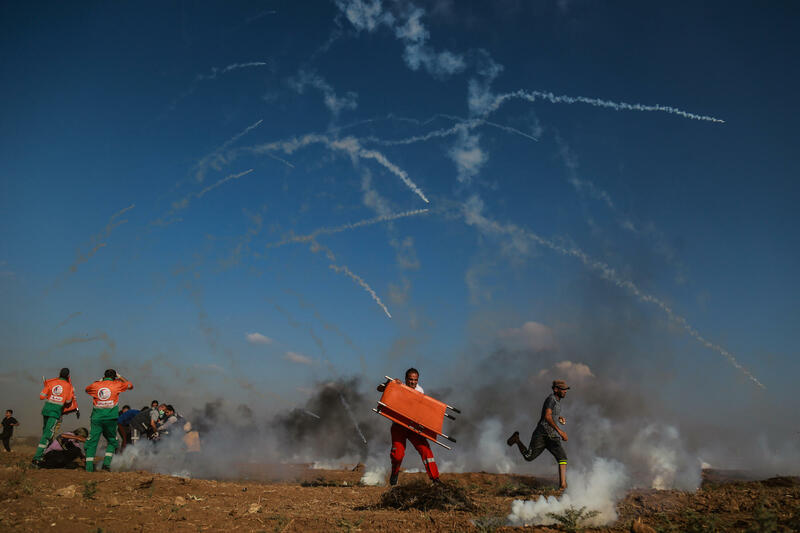 It was also alleged that “organizers urged protesters over loudspeakers to burst through the fence, telling them Israeli soldiers were fleeing their positions, even as they were reinforcing them.” But if this incident indeed took place, it was wholly unrepresentative. As a rule, Hamas and the organizing committee have strained to distance themselves from efforts to breach the fence, in order to avoid giving Israel a pretext to attack the tent encampments. In general, the suggestion that a significant proportion of the 45,000 protesters (Israel’s official estimate) who assembled near Gaza’s perimeter fence on May 14, did so out of ignorance or compulsion lacks not only evidence but basic plausibility. “Everyone in the Gaza Strip knows,” Hass reported, that “the hospitals are way over capacity and that the medical teams are unable to treat all the wounded.” Nor would survivors of Israel’s many “operations” in Gaza have been surprised by the IDF’s resort to lethal force. Is it credible that Hamas could coerce thousands of people to gallop to their death and incur crippling injuries? It’s weird to spend decades urging Hamas to forsake violence and embrace peaceful protest, only to justify the slaughter of unarmed protesters on the grounds that they were organized by, or were members of, Hamas. Is it really to be expected that Hamas should disarm so as to make it easier for Israel to kill them? It appears that, politically, Hamas is damned whatever it does. Under international law, meanwhile, the extent of Hamas’s role in organizing the demonstrations is irrelevant. The people of Gaza have a right to peacefully protest, whereas Israel is not entitled to extrajudicially execute an individual merely because s/he is a member of Hamas. A statement by Salah Bardawil, leader of Hamas in the Gaza Strip, has been widely quoted in order to discredit the Gaza demonstrations. In a television interview, Bardawil claimed that 50 of the more than 60 people killed on May 14 were Hamas members. This claim has been used to justify the massive deaths Israel inflicted on that day. However, the critical context to Bardawil’s statement was omitted while the moral inferences drawn from it were bizarre. Third, as described above, it is no secret that Hamas has supported and participated in the Gaza demonstrations. In the interests of unity and in line with the nonviolent strategy, Hamas instructed party members who joined the protests to leave their weapons at home, remove their military uniforms, and participate in the marches as civilians with no Hamas insignia or flag. Fifth, as we noted above, membership of Hamas—the ruling authority in Gaza whose political party was democratically elected in 2006—is no justification for extrajudicial execution. It is not a crime if a nonviolent protester also happens to be a member of Hamas. Hamas’s 1988 Charter, which contains antisemitic passages and which looks forward to the “obliterat[ion]” of Israel, is often cited as proof that the movement is dedicated to Israel’s destruction. But that document has long since ceased to guide Hamas’s political conduct. After it won elections in 2006, the incoming Hamas administration wrote to former US President George W. Bush, expressing its willingness to accept “a Palestinian state in the 1967 borders” in the context of an extended ceasefire, and to the Middle East Quartet, emphasizing that it had been elected to pursue “a negotiated settlement with Israel.” Hamas leaders repeatedly declared their “support” for “a Palestinian state on [the] 1967 borders,” joined a national unity government on a platform that implicitly recognized Israel and pledged to adhere to any agreement reached between Palestinian President Mahmoud Abbas and the State of Israel that passed a popular referendum. “[W]e have not given them any options but confrontation,” argued a former head of Israel’s Mossad intelligence service. Constructive engagement might “start the long trajectory that would ultimately lead to… mutual [co]existence,” he said. Since Israel has responded to Hamas’s many overtures with flat rejection, the prospect of a settlement must remain an open question. What is clear, however, is that diplomatic possibilities for compromise with Hamas have yet to be pursued. In sum, here is what actually happened in Gaza during the past ten weeks: On March 30, Palestinian civil society organizations came together to organize a nonviolent protest against the “unlivable” conditions in Gaza; Hamas subsequently joined the undertaking, which came to embrace a broad swathe of Gazan society; tens of thousands of people participated in overwhelmingly nonviolent protests, including “sit-ins, concerts, sports games, speeches, and other peaceful activities;” the demonstrations remained overwhelmingly “peaceful,” even as Israeli snipers carried out a “murderous assault” against “unarmed protesters.” Despite Israel’s provocations, Hamas ordered its members to leave their weapons at home and exerted strenuous effort to keep the protests peaceful in order to deny Israel a pretext for repression; Israel provided no credible evidence of armed protesters, while local and international human rights workers “did not witness weapons or armed persons” at the demonstrations; the overwhelmingly peaceful demonstrations peaked on May 14, when Israeli forces systematically shot more than 1,300 demonstrators with live ammunition and killed more than 60. In the face of Israel’s onslaught, and as the international community has looked on with indifference, the people of Gaza exhibited near superhuman courage and restraint. No amount of lies can efface this ineffaceable truth.